Obviously each show is different, as the guest changes daily, and numerous factors can affect where the conversation will go. Comedians, off script, but not off stage, will vary wildly, even if the questions were the same to each, which I doubt, given Goldsmith’s ability to gently coax out interesting anecdotes. Bridget Christie made an intriguing guest. Despite prizes, accolades, and much press attention courtesy of last year’s show, she really doesn’t see herself either the successful comic, or the brilliant feminist voice that others do. 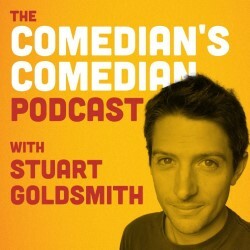 Goldsmith asks about writing shows, getting into comedy, and Christie’s family background. It seems odd that she seems surprised, and takes a moment each time to answer these, as her level of success would suggest many interviews taking in these topics. Perhaps the fact that a fellow comedian is asking them elicits more thought, and greater detail than when a journalist does. This show is part stand-up, but also something else. Not quite a performance, not quite an interview; it’s certainly interesting to have been part of, but I can’t help but think this is one show where the stars listed mean nothing – it could easily be five stars with the right guest – but I doubt even Goldsmith’s charm could make up for an unresponsive performer.